Think you can’t afford a custom home theatre or sound system? Think again. PEAK Audio Video is your friendly neighbourhood AV specialist. 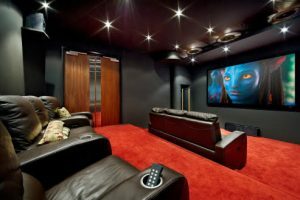 We’ve designed and executed some of the most impressive home and commercial cinema systems and listening spaces in Atlantic Canada. We provide complete project management services and work with a full range of tradespeople. We can also collaborate with your current contractor. PEAK provides custom solutions at every price point. We listen, learn, and help you select an entertainment system to satisfy your tastes, preferences, and budget. It’s not about us – it’s about you. PEAK’s HiFi division works with you to design and construct any listening space, from entry level to high end. PEAK has everything you need to conceive and create your dream home theatre and maximize your viewing and gaming experience, from top quality TV brands to surround sound systems and furniture. At PEAK, we’re more than just audio enthusiasts. Whatever your viewing needs, we’ll find the right television at the right price, and make sure you get the most out of your purchase. We’re you’re best buy TV experts, whether you’re looking for the latest 4K or OLED TV or something a little more modest. We stock a wide variety of flat and articulating TV wall mounts, including custom automated TV systems that can perfectly conceal your TV within cabinets, half walls, floors, or wherever you need. PEAK’s specialists work independently or in partnership with your contractor to ensure that your job is done according to specifications. PEAK offers a number of wired and wireless distributed audio solutions specially designed to match incredible fidelity, with the latest in streaming source variety and intuitive control. Easy to install, easier to enjoy. We believe the best method to distribute video throughout your home is with an HDMI switch with HDBaseT technology built-in. Keep all your cable or satellite boxes, Blu-ray players, media players, receivers, gaming consoles, and anything else you want connected to your TV in one cabinet.